This vacant lot at Ceape Avenue and Broad Street, which is currently used for overflow parking at the Leach Amphitheater, could become the new home of an expanded Day By Day Warming Shelter. A downtown homeless shelter is proposing to double in size, move to year-round operations and construct a new facility on a site directly across from the Leach Amphitheater and a block from the city’s Convention Center. Day by Day Warming Shelter, which currently operates from the school basement of the old St. Peter’s Catholic Church at 449 High Avenue, wants to build on a vacant lot at the corner of Ceape Avenue and Broad Street. Officials provided details of the shelter’s plans at the June 6 meeting of the Oshkosh Redevelopment Authority. Moving in phases, the shelter wants to expand from 25 to 55 beds and eventually offer services throughout the year. While the need to address the problem of homelessness, particularly in winter, is widely accepted, some question the wisdom of putting a shelter in this particular location. “I think there are better places,” said Mayor Steve Cummings. 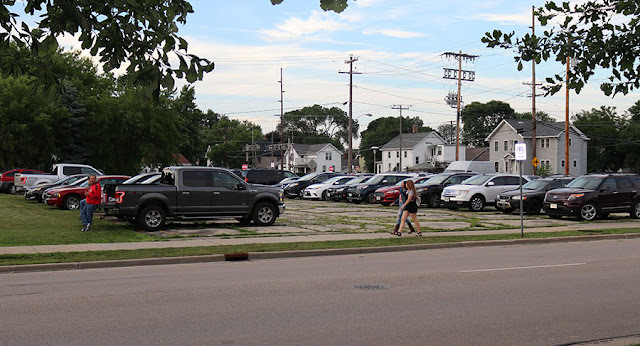 In addition to its proximity to the Leach and the convention center, the lot that the shelter wants is close to Riverside Park and a couple of blocks from one of four priority development sites that were identified in the city’s new downtown plan. The shelter’s proposal is slowly moving through the city’s review process. On June 26, the Common Council approved the use of $150,000 in federal funds to support the project without considering the specifics of Day by Day’s plans. The money could be used to acquire the Ceape Avenue site from the Housing Authority. The funds for the lot would come from the city’s $815,000 Community Development Block Grant (CDBG) plan. This program allows cities to tap federal money to provide housing and economic opportunities for people with low or moderate incomes. Shelter officials say the proposed location has many advantages for shelter guests because it is close to support facilities such as the county Department of Human Services, the Oshkosh Public Library and the Salvation Army. The site is accessible by Oshkosh transit and is located near where homeless people currently spend their time. The shelter is under a temporary use permit, which only allows it to be open 180 days per year. The permit is required due to a fire code because the building isn’t handicap-accessible and lacks an adequate sprinkler system. Day by Day hopes to break ground at the lot in January 2019 but needs to raise $3.2 million to build its new facility, separate from its operational budget.